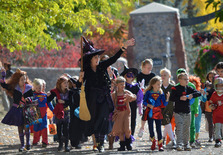 Little Haunts is Salt Lake City's kid-friendly Halloween event for the entire family! It's a “not so scary" haunting just for children and has delighted guests for over a decade. It's not scary at the Park while the sun is still shining; s spooks can come with or without a costume for this fun filled day of trick-or-treating and other activities. Make this event part of your family's Halloween tradition. Other highlights include: Candy Cannon Alice the Friendly Dragon Story telling by our adorable Witch Costume Parade Creature Encounters Games and Take Home Crafts Alice the Dragon Trick or Treating throughout the Park. 2.00 off each ticket with valid Utah Kids Club card (May not be combined with any other discount or offer, must show Utah Kids Club card for discount) AND be sure to use the FREE ticket that was mailed in your Ultimate Halloween Package!